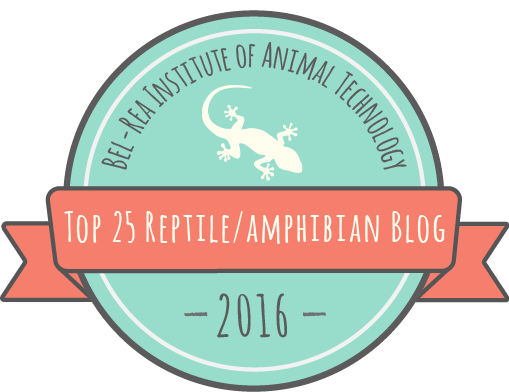 This article is part of a series highlighting new research in snake biology presented by herpetologists at the World Congress of Herpetology VII in Vancouver, British Columbia. If you want to learn more about the WCH, check out the June 2012 issue of Herpetological Review, or follow the Twitter hashtag #wch2012, with which I will tag all posts in this series. An Eastern Indigo I was very fortunate to see in 2010. Ask anyone: the Eastern Indigo Snake (Drymarchon couperi) is one of the most commanding and majestic snakes anywhere. Once found throughout Florida and in the coastal plain of southern Georgia, extreme south Alabama, and extreme southeast Mississippi, today the Eastern Indigo survives in numbers only in peninsular Florida and southeast Georgia. Although the species persists in low numbers in the Florida panhandle, it has been extirpated from the rest of its range as a result of declines in and alterations to the longleaf pine (Pinus palustris) ecosystem that it inhabits and on which it critically depends. One of the largest snakes native to North America, D. couperi is one of five species belonging to a genus that ranges from Georgia to Argentina. Closely related to Racers (Coluber), Patch-nosed Snakes (Salvadora), and Whipsnakes (Masticophis), Indigo Snakes are charismatic and harmless. Carl Kauffeld called them "truly handsome and impressive" in his classic 1957 book Snakes and Snake Hunting. My herpetology professor, Whit Gibbons, told us a story of an exotic dancer who called his lab asking to borrow one to use in her show. This was during the early 1970s, when Eastern Indigos were common in the pet trade, before their federal listing under the Endangered Species Act (one of the first and still one of the only snakes ever listed). A Gopher Tortoise basks at the entrance of its burrow. and egg-laying microhabitat is lost. Unfortunately, Indigo Snakes are one of North America's most endangered snake species, primarily as a result of habitat destruction and fragmentation. 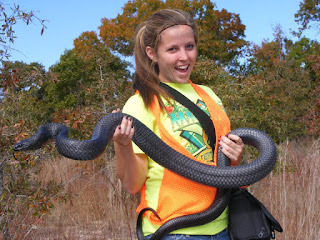 Research by Natalie Hyslop showed that male Indigo Snakes in southeastern Georgia have home ranges as large as 3,000 acres (nearly five square miles), and one male Indigo Snake moved a distance of about 13 miles (22 km) over two years. 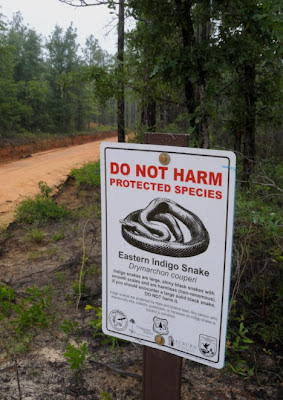 As anyone familiar with the southeastern United States knows, it is almost impossible to find five square miles without a road interrupting it, and, as a result, many Indigo Snakes are run over and killed as they cross busy highways and interstates. Conservation of such a highly mobile species is extremely difficult, and by the early 2000s, population strongholds in Georgia were limited to two military bases, Fort Benning and Fort Stewart, where large tracts of uninterrupted sandhill habitat still remain. 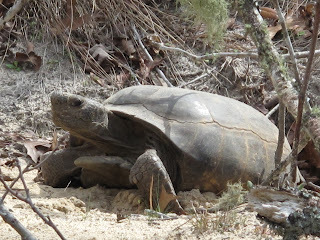 Furthermore, the degradation of longleaf pine sandhills via fire suppression encourages the growth of hardwood deciduous trees that close the canopy and push out Gopher Tortoises (Gopherus polyphemus), the burrows of which are critical Indigo Snake microhabitats during the winter breeding season. Although habitat degradation is the most insidious factor contributing to Indigo Snake declines, over-collection for the pet trade and malicious killing (both intentional and collateral, as when gasoline fumes are pumped down a tortoise burrow to kill rattlesnakes) are also considerable threats. In 2008, a non-profit group called The Orianne Society was founded with the purpose of saving the Eastern Indigo Snake from extinction, which seemed inevitable given the rate of land development and habitat degradation in the southeast. TOS has advanced Indigo Snake conservation in a myriad of ways, from acquiring and restoring land to captive breeding. At the Mopani Indigo Snake Preserve in south-central Georgia, TOS biologists are tracking Indigo Snakes using wildlife detector dogs, also used to track other elusive wildlife, from whales to bats to salamanders. Last winter, I was generously invited to witness firsthand the effectiveness of CJ and his handler, biologist Kiley Briggs, at tracking Indigo Snakes at Mopani. Indigo Snakes are known to feed primarily on other snakes, lizards, turtles, small mammals, frogs, and birds. Juveniles might feed on fish in the wild, because they spend the early part of their lives in mesic lowland areas and readily consume fishes in captivity. Unusual food items, in comparison to that of other snakes, include small Gopher Tortoises and all venomous snake species native to the Southeastern US (including Copperheads, Cottonmouths, Coral Snakes, and several rattlesnakes). For this last reason, Indigo Snakes generally have a more positive reputation than other snake species among rural residents of the southeast. At the WCH7, Jim Godwin, a zoologist with the Alabama Natural Heritage Program, and Jimmy Stiles, a student with herpetologist Craig Guyer at Auburn University, brought us good news regarding the Eastern Indigo Snake in Alabama. Due to the collaborative efforts of over a dozen institutions and organizations, including the Alabama Department of Conservation and Natural Resources and TOS, captive-reared Eastern Indigo Snakes have recently been released into Covington County, Alabama's Conecuh National Forest. These snakes were born in captivity from wild females caught in Georgia and head-started at Zoo Atlanta. The plan was to test the effects of a hard (unpenned) or soft (penned) release on snake survival by following snakes with radio telemetry, but the 1 hectare pens built to contain the soft release animals "are just a suggestion to the snakes", according to Godwin. Instead of waiting the intended 90 day soft release period, many of the soft-release snakes released themselves 5-90 days after their initial release, by going under the fence. Because the snakes were implanted with radios, their progress could be followed. Fortunately, the team found that there were no significant differences in survival between snakes that had been hard and soft released, and that hard and soft release snakes had similar sized home ranges. Significantly, the percent overlap between male and female home ranges was higher for soft release snakes, and this effect increased with time spent in the enclosure. In terms of management implications, releasing snakes in pens does not seem to have a negative effect on snake survival and probably ultimately has beneficial effects on the structure of the established population. 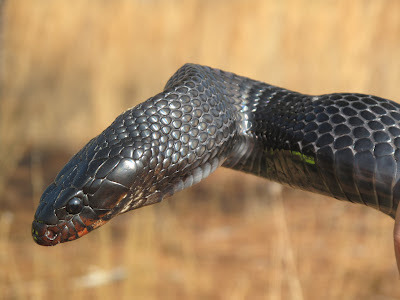 Earlier attempts to reestablish Eastern Indigo Snakes in Alabama were unsuccessful, possibly both as a result of the hard release techniques used and the release of too few snakes in too many locations. In the two years since the initial release in 2010, most of the Conecuh Indigos have survived, although several have been killed by predators and several more run over by cars. Improvements in the fire management regime in the Conecuh and continued research on the reintroduced snake population should mean a bright future for the Eastern Indigo Snake in Alabama. Clearly I could write about Indigo Snakes all day, but if you want to learn more, check out The Orianne Society's website or read some of the papers linked in the References section below. Thanks to Mark Wallace for his photo of the happy volunteer. Thanks Dave, I agree and I hope so too. Fortunately, the same habitats and habitat features (e.g., tortoise burrows) that help support indigos should help these species too - but it would be great to see reintroductions of southern hognose to Alabama and Mississippi one day. Until we've really figured out what caused the declines though, it's hard to know whether an effort like that would even succeed. Andrew -- nice write up. Ditto on the paradigm. RE Southern Hog-nosed Snakes -- what are people thinking caused the declines? Fire suppression? There's probably not a single cause, although the declines seem to be progressing from west to east. I'm sure fire suppression and road mortality are having huge impacts, but it seems to me that these things should also be hurting them equally in North and South Carolina, where they are seemingly still abundant. Could be related to fire ants (egg, juvenile, or even adult mortality), although these are in the Carolinas too, just not for as long. It's hard to say. I have heard it suggested that simus has always been rare and/or difficult to survey, indicating that its current status is no cause for alarm. Hard to say. But, your mention that declines are progressing is interesting, what is that based on? Mostly on things I've heard people say, so you could be right. There is this paper from 2000: Tuberville et al. Apparent decline of the southern hog-nosed snake, Heterodon simus. Journal of the Elisha Mitchell Scientific Society 16:19-40. The last report from Alabama was apparently in 1970, the last in MS in 1981, I don't know if any have been found there more recently than 2000. I've heard that they've become harder to find in the Florida panhandle in recent years. Jeff Beane tells me that better than half of the historical simus localities in the NC Sandhills have been lost to some form of habitat degradation, and that 9/10 simus he finds at the remaining localities are DOR, so it's amazing they've lasted this long. Indeed Calvin. They are less dependent on tortoises in Florida than they are in Georgia, but overall on the decline everywhere. Best of luck spotting one! In the mid 1960's I lived at an orphanage in Ft. Mitchell, Ky. One afternoon while playing a game of baseball on the orphanage baseball field, we came across a large black snake coming down a tree, which I remember they identified as a "black snake". It was very long. In the same time frame I remember there was a copperhead snake found in an enclosed entrance to another building. We also used to go down to the creeks and look for water moccasins. So the black snake, or eastern indigo snake, also inhabited Northern Kentucky land, at least they did in the 60's. Hi Dave, thanks for reading and writing. What you saw during that baseball game was probably a black ratsnake, not an indigosnake. They are found throughout Kentucky, are jet black as adults, and frequently climb into (and down from) trees. Indigo snakes probably didn't get too far north of their current range since the last Ice Age. Sounds like an awesome experience! I have a Indigo snake that has stayed around for about five years. I am in a wooded area with no other houses around. It loves to stay on a shaded area next to my house or under a tree next to my pond. I love to see it after winter so I know it is fine. I live in north west fl. That's awesome! You're lucky to have indigos on your land. They are very special snakes.